We now have a 2 month trial of over 200 peer-reviewed academic journals from Taylor and Francis, ending 31st March. This month our popular Library Loves series returns highlighting Pharmacy and Pharmacology resources available through St George’s Library. The following websites form a comprehensive selection of online resources providing guidance, information and support on the use of medicines; along with news and analysis on topics relevant to pharmacy and pharmacology. A comprehensive suite of guidance, advice and support for the delivery of quality, safety and efficiency in the use of medicines. Featuring the latest UK community pharmacy news Chemist + Druggist is a weekly magazine containing news on clinical and business issues, alongside articles and training courses to assist pharmacists with their CPD. the eMC contains up-to-date, easily accessible information about medicines licenced for use in the UK. With over 10,600 documents, all of which have been checked and approved by either the UK or European government agencies which licence medicines. Specialist Pharmacy Services (SPS) aim to be “The first stop for professional medicines advice” SPS brings together expertise from Medicines Use and Safety, Procurement, Quality Assurance, Technical Services and UKMi. Delivered by senior pharmacy professionals and with a focus on hospital care, Specialist Pharmacy Services (SPS), underpin the safe, effective and efficient use of medicines across the country. The Cochrane Library is freely available and consists of several databases supporting evidence-based medicine. These journals comprise a list of ‘key titles’ for pharmacists and pharmacologists which the Library recommends for those wanting to keep up to date in this field. All titles are available through the library. Staff and students of St Georges, University of London can access the Journals via the St George’s Library Journals A-Z list: accessing titles offsite will require you to enter in your SGUL username and password. NHS staff can access these titles via the NICE Journals A-Z search using their OpenAthens account details. The DTB provides rigorous and independent evaluations of, and practical advice on, individual treatments and the overall management of disease for doctors, pharmacists and other healthcare professionals. Published monthly by the BMJ the journal aims to provide informed and unbiased information on medical conditions, medicines and other treatments to enable readers to make informed choices and ensure patients get the best care. The BJP gives leading international coverage of all aspects of experimental pharmacology. Alimentary Pharmacology & Therapeutics is an international journal concerned with the effects of drugs on the human gastrointestinal and hepato-biliary systems, particularly with relevance to clinical practice. Published on behalf of the British Pharmacological Society, the British Journal of Clinical Pharmacology contains papers and reports, research and review articles on all aspects of drug action in humans. Antimicrobial Agents and Chemotherapy (AAC) features interdisciplinary studies that build an understanding of the underlying mechanisms and therapeutic applications of antimicrobial and antiparasitic agents and chemotherapy. The European Journal of Clinical Pharmacology publishes original papers, short communications, and letters to the editors on all aspects of clinical pharmacology and drug therapy in humans. Coverage includes therapeutic trials; pharmacokinetics; drug metabolism; adverse drug reactions; drug interactions; all aspects of drug development; prescribing policies; pharmacoepidemiology; and matters relating to the safe use of drugs. Clinical Pharmacology & Therapeutics (CPT) is a cross-disciplinary journal in experimental and clinical medicine devoted to publishing advances in the nature, action, efficacy, and evaluation of therapeutics. Pharmacology & Therapeutics presents clear, critical and authoritative reviews of currently important topics in pharmacology. Trends in Pharmacological Sciences is a monthly review journal focusing on pharmacology and toxicology. The Journal of Antimicrobial Chemotherapy is a journal of the British Society for Antimicrobial Chemotherapy (BSAC) and is among the foremost international journals in antimicrobial research. These databases contain relevant articles and papers for those interested in pharmacological research. The Library provides access to the EMBASE and MEDLINE databases for SGUL staff and students and NHS staff. SGUL staff and students should follow the relevant links from the database entry on the A-Z database list, offsite access will require an SGUL username and password. NHS staff will need an NHS OpenAthens account to access these databases using the updated Healthcare Databases Advanced Search (HDAS) platform. ChemIDplus is freely available and does not require a login. The EMBASE database covers biomedicine and pharmacology; particularly strong in the areas of drugs, toxicology and psychiatry; indexing over 3,500 international journals. Medline is a general medical database produced by the U.S. National Library of Medicine. The database contains millions of citations, derived from thousands of biomedical and life science journals. ChemIDplus contains over 400,000 chemical records. More than 300,000 of those records include chemical structures. ChemIDplus allows you to search by name/synonym, physical properties or toxicity in order to identify chemical substances. The BNF provide prescribers, pharmacists, and other healthcare professionals with sound up-to-date information about the use of medicines. Covering medicines generally prescribed in the UK, the BNF includes key information on the selection, prescribing, dispensing, and administration of medicines. Updated twice a year the BNF is available in print or online on MedicinesComplete or NHS Evidence. Like the BNF the BNF for Children aims to provide prescribers, pharmacists, and other healthcare professionals with sound up-to-date information on the use of medicines for treating children. Both the BNF and the BNFc are available as iOS and Android Apps; you will need an NHS OpenAthens account to access the content. More information can be found at the NICE apps for smartphones and tablets page. Information on any aspect of drug therapy can be obtained from Regional and District Medicines Information Services. The Medicines and Healthcare products Regulatory Agency regulates medicines, medical devices and blood components for transfusion in the UK. MHRA is an executive agency, sponsored by the Department of Health. Recognised globally as an authority in its field, the agency plays a leading role in protecting and improving public health. The European Medicines Agency (EMA) is responsible for the scientific evaluation, supervision and safety monitoring of medicines developed by pharmaceutical companies for use in the EU. The EMA supports scientific excellence in the evaluation and supervision of medicines ensuring that all medicines available on the EU market are safe, effective and of high quality. (ABPI) represents innovative research-based biopharmaceutical companies; companies who supply more than 80 per cent of all branded medicines used by the NHS and who are researching and developing the majority of the current medicines pipeline. The International Pharmaceutical Federation (FIP) is the global body representing pharmacy and pharmaceutical sciences. Through 139 national organisations, academic institutional members and individual members, FIP represent over three million pharmacists and pharmaceutical scientists around the world. The GPhC is the body responsible for the independent regulation of the pharmacy profession within England, Scotland and Wales. Responsible for the regulation of pharmacists, pharmacy technicians and pharmacy premises. The British Pharmaceutical Students’ Association is the official student organisation of the Royal Pharmaceutical Society; founded in 1942 it is the only national body that solely represents pharmacy students and pre-registration trainee pharmacists. For help in viewing or downloading online journals, or accessing databases pop along to the Research Enquiries Desk in the Quiet Study Area of the Library, Mon-Fri 11am-4pm. If you are an NHS user and are having problems with your OpenAthens account, please contact your OpenAthens administrator Zena Ali at zali@sgul.ac.uk or 020 8725 5433. Information on accessing and using some of these resources can be found on the Library website help page. You can search for journal titles using the NHS A-Z Journals List. Make sure you sign in with your OpenAthens login at the top right hand corner of the page. This will ensure that you see our full subscription access. We are currently experiencing problems with offsite (Shibboleth) access to Sage journals. Sage are working on resolving the issues as soon as possible; apologies for any inconvenience caused. Access to Sage journals onsite is working as normal. 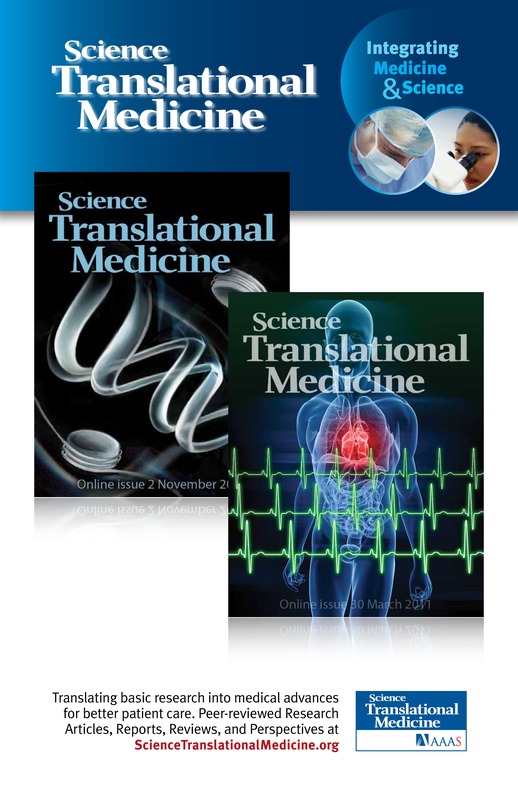 Science Translational Medicine focuses on bringing the latest scientific advances from the bench to the bedside. Despite a growing understanding of human biology, utilizing these discoveries to close gaps in medical knowledge has progressed slowly. Science Translational Medicine aims to publish discoveries capable of generating innovative ways to prevent, diagnose, and treat disease. To browse our list of journal subscriptions see our Journals A-Z list. We are currently unable to access Sage journal content from offsite via Shibboleth. This problem has been logged with Sage and hopefully it will be resolved shortly. We now have access to the Cambridge University Press journals digital archive.